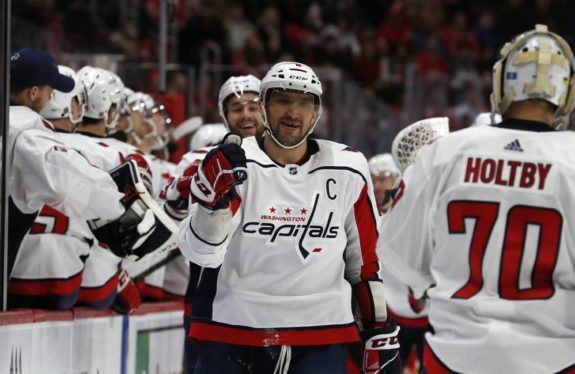 TAMPA, Fla. — Alex Ovechkin scored his 50th and 51st goals of the season, leading the Washington Capitals to a 6-3 victory against the Tampa Bay Lightning on Saturday night. The Lightning played the final two periods without defenceman Victor Hedman, who sustained an upper-body injury late in the first period. NOTES: Lightning LW Yanni Gourde returned to the lineup after serving a two-game suspension. … Washington RW Brett Connolly missed his first game of the season due to illness. … A pregame ceremony was held to present Tampa Bay with the President’s Trophy as the team with the most points in the league. NHL Deputy Commissioner Bill Daly was on hand to deliver the trophy. … The Lightning presented captain Steven Stamkos with a commemorative silver stick for breaking the franchise record for career goals. Owner Jeff Vinik and former team captain Vinny Lecavalier, who held the previous record, made the presentation. … Amalie Arena was sold out for the 199th consecutive game, including playoffs. … Washington C Evgeny Kuznetsov extended his scoring streak to three games.